„An Sibin“ was an Irish pub in Frankfurt Sachsenhausen. Shebeens as written in english, were secret places where the oppressed population continued their, from the English forbidden, favorite pastime, playing music and drinking. In the 1990’s, legally of course, German, Scottish, Irish and breton musicians met for this type of session in many Irish Pubs in and around Frankfurt. Many bands came to life in this time. Despite many formation changes SHEBEEN CONNECTION have always transported the sense of fun and spontaneousness of sessions when playing on Germany’s stages. 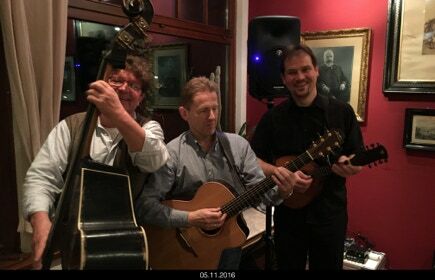 Now after 25 years and innumerable gigs including the Rheingau Musik Festival, their creativity has not been lessened as shown in their interpations of pop music from, for example Dire Straits, Pink Floyd or REM.